Ever since St James’s Church was consecrated in 1836, there have been various ways of referring to the field it towered over. These include ‘a field adjoining St James’s Church;’ ‘St James Field;’ ‘St James’s Park;’ and ‘St James’ Field.’ All are from the nineteenth century. Some were used more than others. This article attempts to tell the story of the ground Grecians call home – from the time it was rented out for farmland, to the eve of the First World War, when it hosted Southern League games. Later, after being hit during the Exeter blitz in May 1942, St James’s Church was demolished. Before the end of the war, a charity match was played between two American Football teams from the US Navy. The souvenir programme referred to the venue as ‘St James Park’. This is the form of the name the club uses today. Besides its principal use for farming, by the mid-nineteenth century the land had become a site for travelling shows. So in May 1847, ‘Mr. Heal’s field, St James’ Road’ was where Hughes’s Royal Oriental and Grand Mammoth Equestrian Establishment encamped for two days. A pavilion was put up. Billed as the ‘the most magnificent Cavalcade ever exhibited in Europe’, it featured fifty horses and fifteen Egyptian camels, not to mention a ‘group of fairy ponies and two stupendous elephants’. These were to become annual events. Cricket was probably the first sport to be played on the field. In May 1878, St James’s Institute Cricket Club was formed, replacing the unsuccessful St James’s CC. It was an extension of the Parochial Institute’s objective to be a ‘social centre’ for the parish. A decision was taken ‘to secure Mr. Bradford’s field, near the church, and that play should be on three evenings a week’. For most of the second half of the nineteenth century, Thomas Bradford, a local butcher, and his wife Elizabeth were the sole occupants of the land. The proximity of the field to houses became an issue in July 1886 at a meeting of the City Council. The grazing of pigs was the problem. The Inspector of Nuisances presented a report for the Market Committee. In most cases, ‘swine were being kept remote from any dwelling houses’; one of the exceptions was ‘Mr. Bradford’s field, adjoining St James’s Church’. The Inspector was instructed ‘to give immediate notice and take proceedings’ the moment the animals were deemed to be ‘a nuisance’. Pigs weren’t the only cause for complaint. For residents of St James’ Road, the following year, 1887, began under tragic circumstances. On 9th January a newborn baby was found dead ‘against the door of St James’ Field’. The post-mortem revealed the likely cause of death to be suffocation. One witness, a young lad, related how, when he found the body wrapped in a parcel, it was just before seven in the evening, ‘as shortly after St James’ Church bell ceased ringing’. At the inquest, the jury returned a verdict of ‘wilful murder’. By the early 1890s, St James’s Field was established as one of the city’s main sporting venues, along with the County Ground, to where Exeter Rugby Club had moved in September 1890. Replying to the Bradfords’ ‘To Let’ ads, rugby clubs would make the field their ‘battle ground’ for the season, clubs such as St Sidwell’s, Rougemont and Exeter’s best junior side St John’s. Cricket continued to be played there, and in September 1892 St Sidwell’s School held its first annual athletic sports on the field. It was also used by cycling clubs. Eventually, on Saturday 6th October 1894, what appears to be the first Association Football match at St James’s Field was played. Exeter AFC took on Minehead. It was reported that the kick-off had been set for three o’clock, as the visitors had an early train to catch. In front of ‘few spectators’, Exeter began with two men short. It was Campbell who scored the first goal, as Exeter won 3-0. It seems the visitors were unhappy with the ‘state of the ground’. In Somerset, it was reported that the Minehead forwards had difficulty shooting, ‘the grass in some parts of the field being knee-deep’. Exeter AFC managed to consolidate the position of the game in Exeter, drawing crowds to St James’s Field. But after three seasons, not only did the club have a negative balance and were in debt, questions were asked as to whether it should continue. In September 1896 a solution was found when members voted to form a new club. The name Exeter United AFC was chosen. 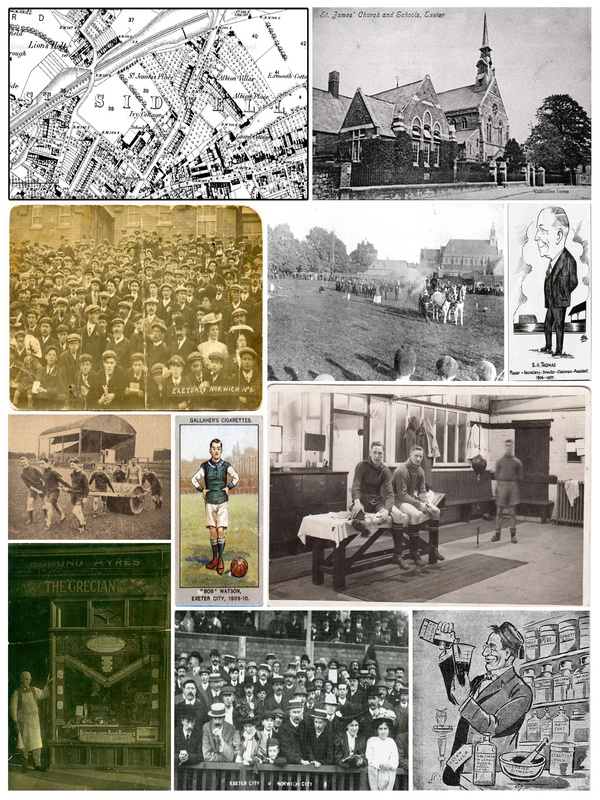 There was a new ground, too, in Magadalen Road, where the Training College played. The fact was, in August, it had been announced that a rugby club had been formed ‘for St James’ parish’ and that Mr. Bradford’s Field had been taken. Exeter United were to return to St James Park in 1900; but after just two seasons the club were forced to vacate the ground. In March 1902 work began to prepare the field for the 34th Annual Co-operative Society Congress. A wooden building went up on the pitch. This would house an exhibition of Co-operative manufacturers. United were unable to find another home, and when they lost 3-0 to rivals St Sidwell’s in October it signalled the end for the organisation. 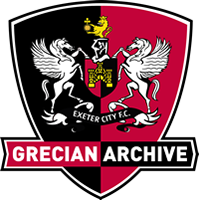 So the Saints, aka Grecians, became Exeter’s number one Association club. St Sidwell’s United took St James Park for the 1903-04 season, and continued to rent the ground when the lease changed in 1904. The reason a ‘Syndicate of citizens’ had taken over the lease was to stop the field being let for shows, which were ‘objectionable to the surrounding inhabitants’. But the menageries continued and residents complained to the City Council. In 1908 there was a further change of lease when Exeter City, ex-St Sidwell’s United, agreed a 21-year lease of the ground. The Club’s plans to move to the Barnfield had failed to materialise. Taking the tenancy of St James Park came soon after the Football Club’s committee unanimously adopted the scheme to turn professional and to apply to join the Southern League First Division. After the meeting at the Red Lion Hotel on 10th March 1908, an architect’s plans for the ground were produced ‘showing grandstand, dressing rooms, banking and full accommodation for 15,000 spectators’. Work began one month after City were elected to the Southern League in May. The laying-out of the pitch along with the banking would take five weeks. This was the start of the development of the ground we know today. On 5th September 1908, before an attendance of ‘between seven and eight thousand’, in the first pro game at the Park, City drew 3-3 with Bristol Rovers. The crowd played their part in the second half comeback, with their side trailing 3-1: ‘excitement became intense, and the game progressed to the accompaniment of an almost continuous roar of cheering.’ At 3-2 there were shouts of ‘Make it a draw, Exeter,’ and when the equaliser arrived, ‘what a scene followed. The enthusiasm of the crowd knew no bounds.’ The first Devon derby was not far off. Following the 1910-11 season, an important adjustment to the ground was made. As the length of the pitch was shorter than FA regulations, City had been forced to play Cup ties at the County Ground. Only with the intervention of the local MP Henry Duke was the club able to extend the pitch. The owner of the land at the Big Bank end was persuaded to part with the required area. The new terrace became known as the Duke Bank. In this first phase of the ground’s history up to World War One, the biggest sporting occasion was the visit of holders Aston Villa for a second-round FA Cup tie in January 1914. 9,600 turned up to see ‘unlucky losers’ City go down 2-1. This was perhaps the first time a game at the Park had been filmed. In April, 11,000 were there to watch the Grecians draw 0-0 with Argyle. The next football on the ground was a practice match in August 1914, the proceeds going to a war charity.